Holyrood Park is a beautiful park in Edinburgh. Home to Arthur's Seat, an extinct volcano which towers over the city. Just a short walk from the city centre, there are lots of walks here for all abilities. And for spectacular city views, you can climb to the summit of Arthur's Seat. Right in the city centre, it's a gentler walk to the top of Calton Hill than Arthur's Seat. The panoramic views from here are absolutely stunning. And there are lots of historic monuments and landmarks to explore on the hill too. Including, the National Monument, Nelson Monument, Dugald Stewart Monument and the Old City Observatory. The Water of Leith Walkway is a riverside walk, which follows the Water of Leith from its starting point in Leith, through the city centre and out towards the village of Balerno in the west. Surrounded by leafy greenery, it's a haven away from the hustle and bustle of the city. The 12-mile long path would take around 7 hours to walk, but there are various entrances and exits along the way. So you can choose the perfect walk for you. The Union Canal starts at Edinburgh Quay in the city centre and leads all the way to the Falkirk Wheel in Fife. Again, this is a long path, stretching 30 miles, but you can start and finish your walk wherever you like. Ideal for a quiet waterside stroll or cycle. The world-renowned Royal Botanic Garden is located just north of the city centre. It's a truly beautiful space, where you can see a wide range of plants, trees and flowers from all over the world. There are also several Victorian Glasshouses here, special exhibitions and events, garden tours and cafes. There are so many more Edinburgh city walks and half the fun is discovering them! If you're still looking for comfortable self-catering accommodation for your Edinburgh walking holiday, Lets Get Local can help. 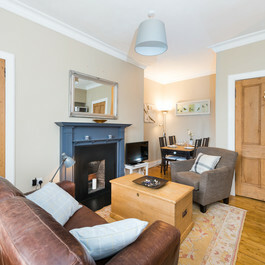 We offer a beautiful selection of city centre holiday rentals. Please take a look and get in touch if you need any further information.